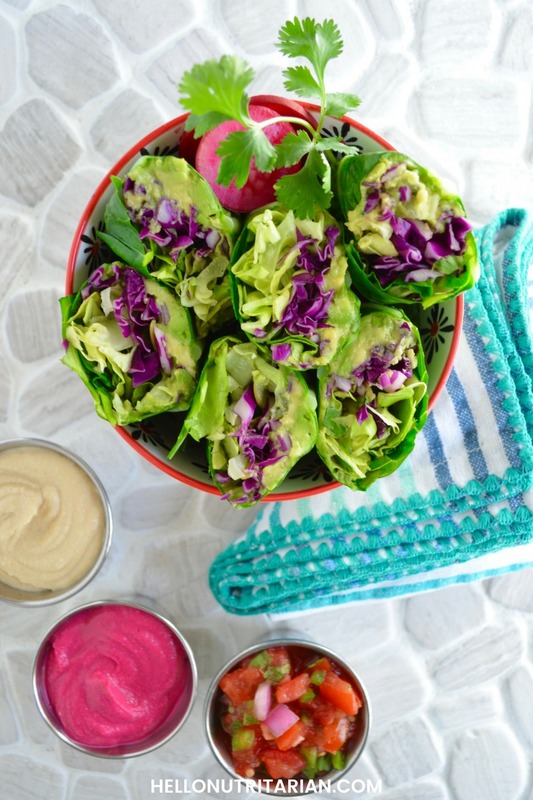 This summer favorite gets a few nutritarian upgrades–you’re going to love these Easy Avocado Collard Green Wraps! Collard greens make the most unbelievably handy, nutritarian-friendly wraps! By themselves, collard greens are one of the highest-nutrient foods on the planet. Add to that the fact that they are sturdy, crunchy and savory, and it’s no wonder they’ve become a staple recipe with the health-conscious crowd. And I’m finally a cool kid too! I’m not going to lie, it took me years to get up the drive to attempt making collard green wraps. But in the name of nutritional excellence I overcame my intimidation and now I’m wrapping ALL THE THINGS in collard greens! 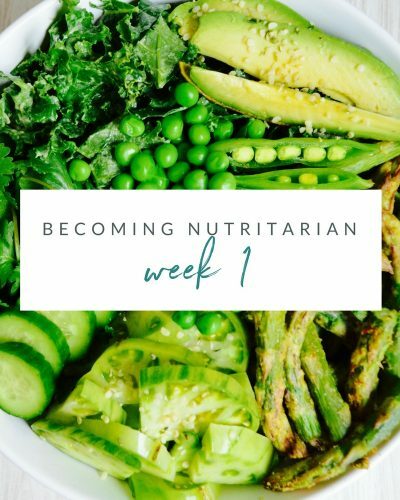 Being a nutritarian is all about eating the highest-nutrient foods you can. Your goal is simple: eat more nutrient-rich food and minimize processed foods. 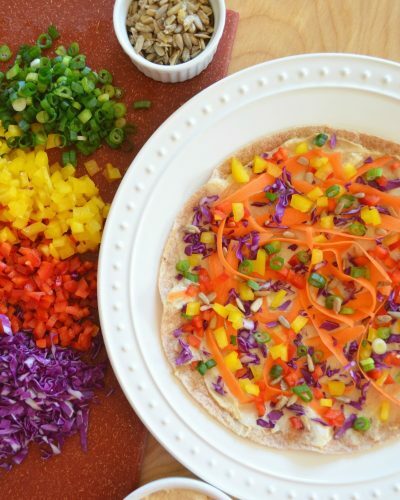 The daily whole wheat or sprouted grain wrap or piece of bread is perfectly acceptable, even when you’re following Dr. Fuhrman’s Aggressive Weight Loss Plan, and fits under the limited “whole grains” category. 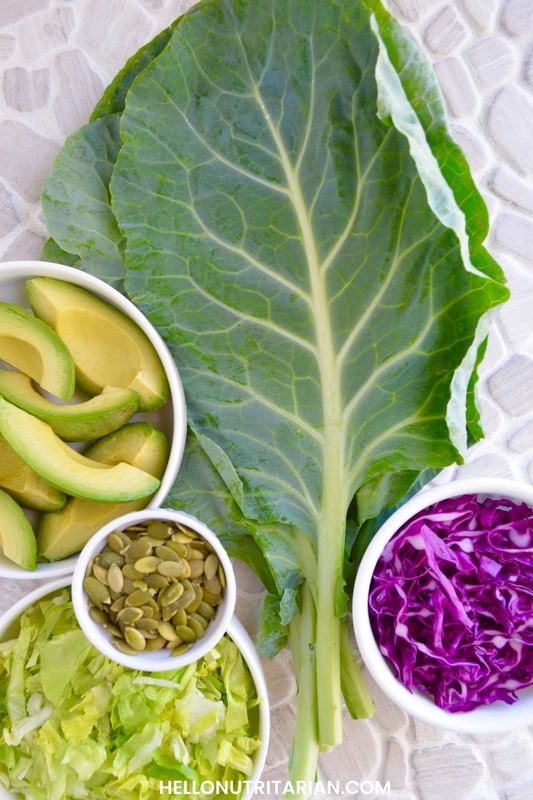 You can go the extra-nutritarian-mile when you swap in a collard green leaf as your wrap instead! There are two challenges you need to overcome to make the perfect, pliable collard wrap: the center stalk and preventing breaks. When I set out to conquer the collard wrap, the first issue I encountered were the collards’ thick center stalk. I tried cutting them down by standing the leaf up on its stem and slicing down. This proved just as difficult to do as it is to accurately describe in words! Simply start at the bottom of your leaf and peel upwards. I found it takes 3 to 4 rounds to get the center stalk fully flush with the rest of the leaf–and that is your goal! The next step is making your leaf more pliable and less prone to breaking–cause no one likes their filling spilling all about! 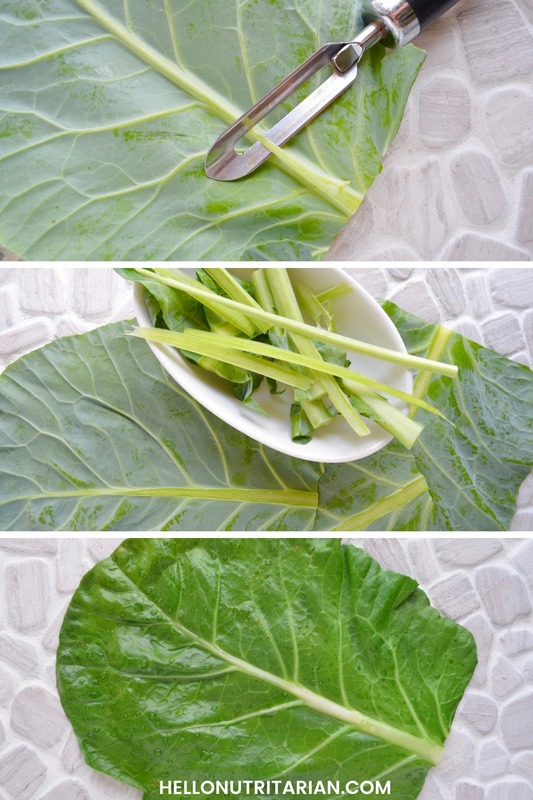 Here’s the trick: Take your collard leaf (the larger the leaf the better) and washing it in water. Then place it on a microwave-safe plate and heat for 10 to 15 seconds on high. This will turn the collard green leaf a lovely bright and vivid green and make it much easier to wrap with. 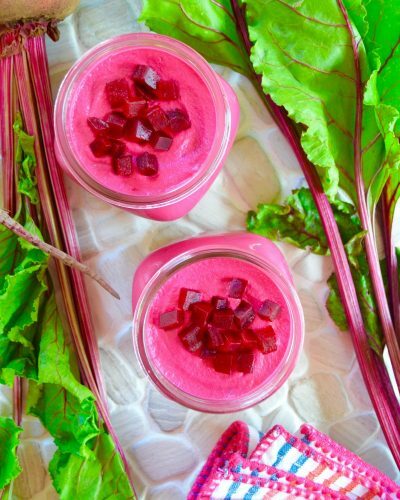 Granted these are quite yummy ingredients you need to take care not to over-stuff! When you get to the rolling stage, the less stuffing the easier it is to roll these wraps up properly and beautifully. It also depends on the size of your collard green leaf. The larger the leaf the more stuffing it can handle. My hubby didn’t just serve as my hand-model for these shots but he also helped me figure out the trickiest part of this recipe. See, I wanted that beautiful center stalk and natural veining to be center-stage in the final product. Unfortunately, many of the recipes I found had the wraps done from bottom to top. Orient the collard leaf lengthwise and add the stuffing just below the center stalk in the middle of the leaf. Fold the lower portion of the leaf over the stuffing. Fold the two sides of the collard leaf in towards the stuffing. Continue to roll the wrap up. 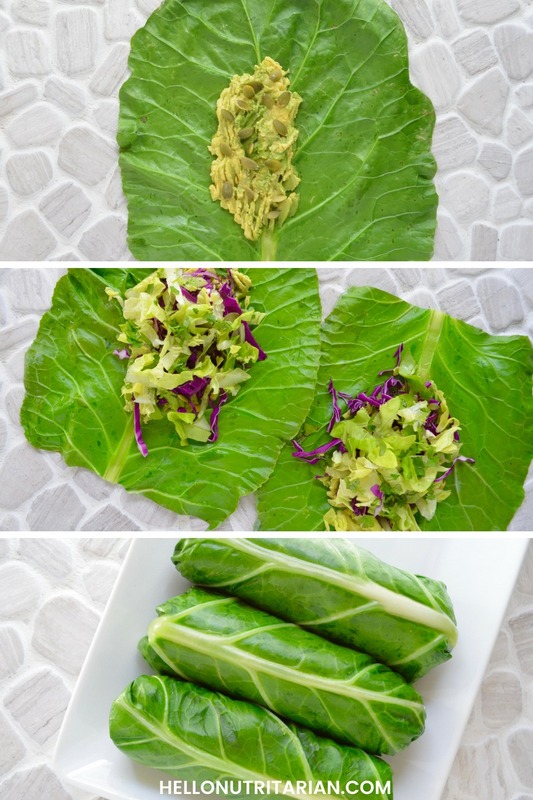 After you’ve rolled your Simple Avocado Collard Green Wraps you can choose to keep them whole if you’re going to be prepping them ahead. They store for up to 48 hours in the fridge, uncut and up to 24 hours cut. 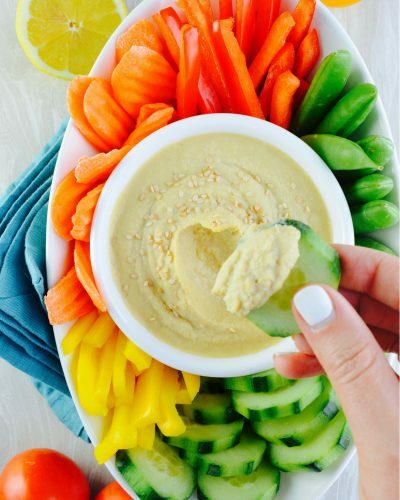 Your next order of business is getting your dip on! 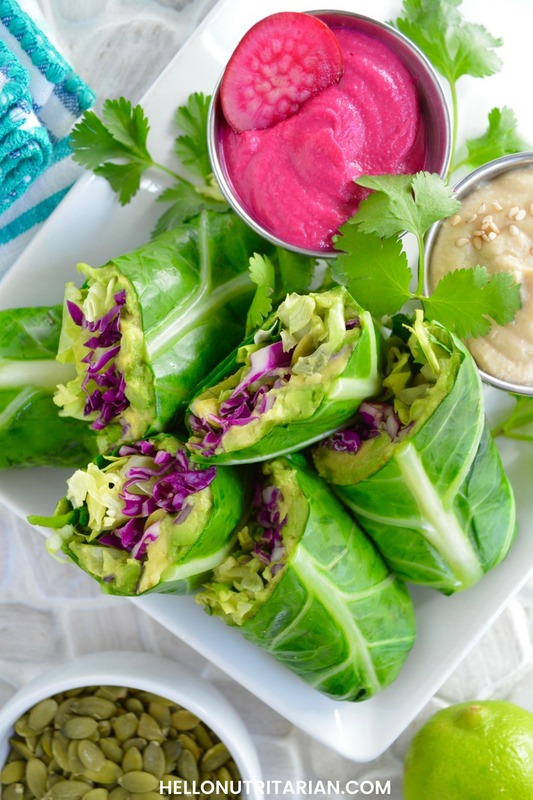 A simple and easy way to make and enjoy collard green wraps using fresh, healthy, no-cook, no-oil, no-added-salt, nutritarian ingredients. Trim off the bottom stems of your leaves, just up to where the leaf starts. Use a potato peeler to shave off the center leaf stalk on the ribbed protruding side of the leaf. Wash the shaved leaf in water and then place on a microwave-safe plate and microwave each leaf for 10 to 15 seconds on high power. Start with the leaf on it's side, length-wise. Mash the avocado and separate evenly between the 3 leaves. Taking care to add it just below the center-stalk and in the center leaf. Top with the raw seeds (divided equally). Follow with the red cabbage and then finally with the lettuce. Before rolling the wraps squeeze the lime over the stuffing in each wrap. Fold the bottom part of the leaf over the stuffing. 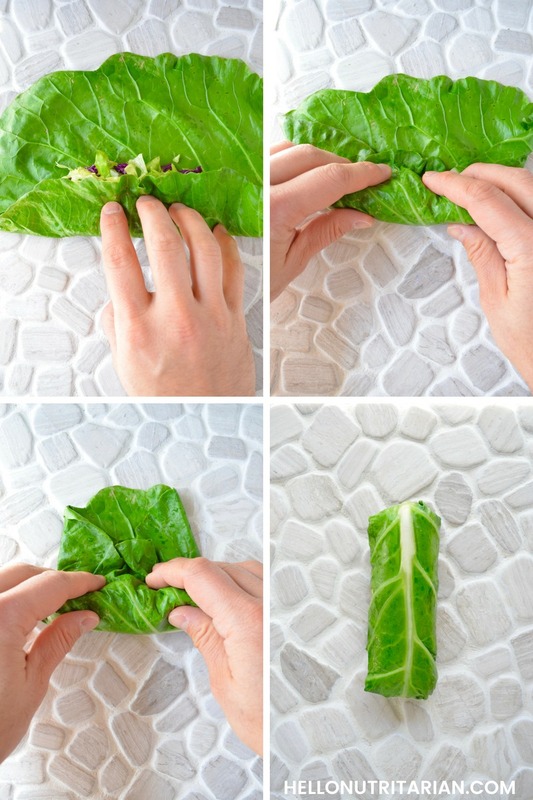 Roll the leaf down and around so it's hugging the stuffing, then fold the two sides of the leaf inwards. Using a serrated knife, cut in half and on an angle in the middle of the collard wrap. Store in the fridge, uncut, for up to 48 hours. Or store cut for up to 24 hours. The lime juice will hep to keep the avocado from turning color too much. 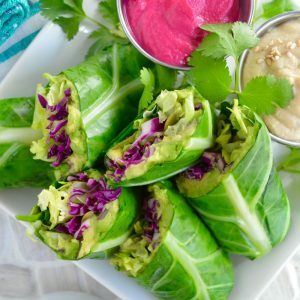 If you give this Easy Avocado Collard Green Wraps recipe a try I’d love to know what you think–please leave a rating and comment below! I’m so happy to hear that you liked the collard wraps and that sounds so yummy to put the Ezekiel bread on the inside! Thanks so much for taking the time to leave a review on this recipe too! I love the collard wraps, but mine went soggy after a day. I ate then for a couple of days then I had to throw the rest away. Next time I will do as you suggested and just make a few for a couple of days and then make some more after that, how do you keep the collards fresh? So happy to hear you tried the collard wraps!! This recipe is not condusive for prepping ahead for the week. Collard wraps are most definitely the best when they’re freshly made and up to 24 hours in the fridge. Honestly I’ve never had mine longer than 24 hours because I love eating them so much! If you’re looking for more prep-ahead meals, check out my Food Prep Guide for a list of my favorites! I was really interested in how the collard greens would turn out. At the time I made it I didn’t have the recipe in front of me and just winged it. I blanched the leaves in a frying pan of water instead (each leaf immediately turned that lovely green and it was a great quick and easy job for my 10 year old helping out in the kitchen) and then I filled with farro, artichoke hearts, salsa, and black beans. My 8 and 10 year old loved it. Guacamole would be an excellent addition for next time. Thanks for the idea! Thank you SO much for letting us know a non-microwave of softening the collard leaves!! These have really been a game-changer for me, and out can literally stuff them with ALL THE THINGS and they always taste good! Thank you for your recipe review and lovely comment–so happy they were kid-approved as well! I tried collard wraps from a different recipe but the collard leaf was prepped the same way. I couldn’t eat it cause the small veins in the leaf were tough and stringy. I really tried to eat it but in the end, I ended up just eating the filling. I was so disappointed that just threw the rest of the leaves away. I love cooked collards but I’ll never eat them as a wrap again. I substituted lettuce for the collards. So sorry to hear you don’t enjoy collard wraps, Tere. I’ve found them to be really delicious and I when I’ve made them they weren’t tough or stringy. 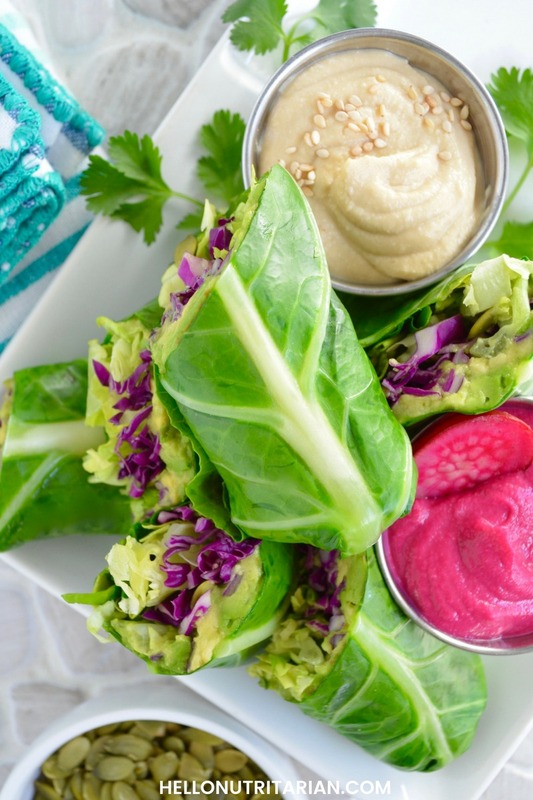 But you can still get all the goodness in a lettuce wrap too!